Stylish HP Pavilion 15-p033cl reviewed on this page offers decent performance of AMD A10 processor and large 12GB memory and has a 1 TB size hard drive, a 15.6 inch touchscreen to use with Windows 8 apps and functions and a DVD Drive unlike many modern day laptops, and it is a Grade A certified refurbished laptop computer by Hewlett Packard and shows no wear (or very little to even notice), it includes all the original accessories and 90 day warranty as well. 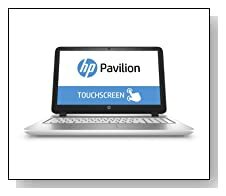 HP Pavilion is offered with the low-voltage quad-core processor AMD A10-5745M APU processor (4MB L2 Cache) from 2.1 GHz speed to 2.9 GHz with turbo- speed increasing dynamically depending on tasks at hand, 12GB DDR3 SDRAM at 1333 MHz on 2 DIMMs, 1024GB at 5400 rpm spindle speed hard drive with HP ProtectSmart HD Protection and Windows 8.1 (64-bit) operating system. The overall performance you will experience with the A10-5745M compares well to the Ivy Bridge Intel i3-2310M, so it can handle majority of the modern day applications and many current games. Being a low voltage processor the TDP- Thermal Design Power of the whole APU is rated at 25 watts. 15.6 inch high definition BrightView WLED-backlit touchscreen display has the 1366x768 pixel max screen resolution and AMD Radeon HD 8610G graphics with up to 6272MB total graphics memory (shares the memory with the CPU as it doesn’t come with a GPU of its own) with similar overall performance to the dedicated Intel HD Graphics 4600 or NVIDIA GeForce GT620M. You have the BeatsAudio sound processing and double speakers for decent audio performance and front facing HP TrueVision high definition webcam with built-in dual array digital microphone with background noise suppression for fun and easy Skype chats. Gaming performance is fine for the price level but you can’t expect to play the most modern games at higher settings, you will need to turn down resolution and settings with some modern games. 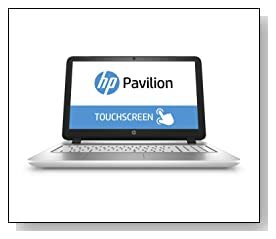 HP Pavilion weighs 5.62 pounds with dimensions of 0.99 x 15.14 x 10.24 inches- fits in a standard backpack easily and is fairly portable with its 15.6 inch screen- although a little heavy because of the DVD drive and touch display. It has a full-size island-style keyboard with numeric keypad for easily entering numeric data and HP multi-touch Imagepad without on and off button to use on Windows 8.1. Battery life is up to 4 hours from its 4-cell 41WHr 2.8Ah lithium-ion battery, depending on how you use the computer. Connectivity features include the SuperMulti DVD burner, 10/100BASE-T Ethernet LAN with RJ-45 connector, 802.11b/g/n WLAN, Multi-format digital media card reader for Secure Digital cards, 2 x USB 3.0 ports, 1 x USB 2.0 port, an HDMI port and a Headphone-out/microphone-in combo jack. Conclusion: HP Pavilion 15-p033cl is a decent modern 15.6 inch touchscreen laptop with a nice feel and good features such as DVD Drive, 2 x faster USB 3.0 ports, HDMI port to watch your movies or play games on your larger screen HDTV via an HDMI cable, 10-key numeric keypad, display quality, a powerful processor, large amounts of system memory and hard drive but on the other hand one of the customers complained about the half size function keys and the feel of the trackpad so you may want to use a wireless mouse and another customer about Windows 8 and wireless issues they had when they first started using it but then many people still prefer the older Windows 7 and it is not really the fault of this laptop, most computers come with Windows 8.1 installed these days and overall it is a cool machine offering decent value for money. You may or may not like the white colour- it is a personal choice and for gaming you would need a more powerful discrete graphics card- at least mid-range so you can play more of the later games at higher resolutions, problem is not the CPU here but the dedicated GPU that has a more or less equivalent performance to Intel HD 4600.